Sorry for the long pause between written posts. I mentioned this before, but I'm currently house hunting, so talking to mortgage companies and looking at homes is taking up a LOT of my time. Once I find a place and settle in things will back to normal. In the meantime, don't be fooled! This bag says "new" but these have been out for months, maybe even half a year at this point. Still, "new" or not, I was intrigued. Strawberry is usually a staple for every fruity mix. 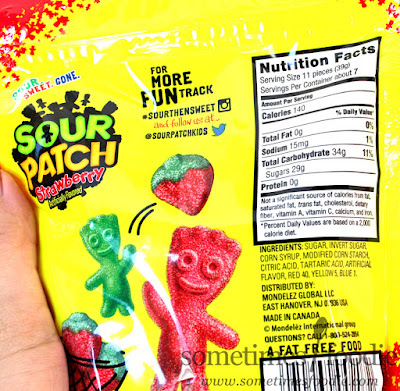 There's the coveted strawberry Starburst, the classic red skittle, heart-shaped Runts...every candy brand offers a strawberry-something, well everyone except for Sour Patch Kids that is. Sour Patch hasn't really explored strawberry flavored sweets before, have they? 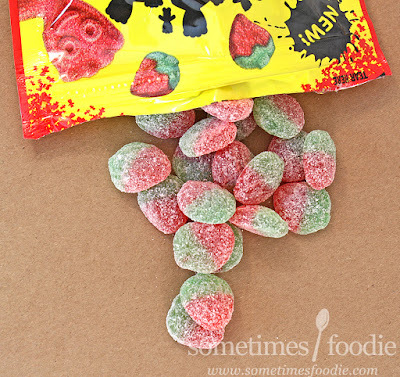 The red "kids" in the original bags are "red-berry" flavored, which tastes similar to Swedish Fish with a bit of a raspberry-edge, and even though there was a strawberry-kid in the Sour Patch Kids Berries line, I haven't seen a bag of those in ages. (According to Google they're still around though.) It took some time, but we now have a stand alone flavor, similar to their sour Watermelon Slices, and I'm excited to check it out. I popped a little sour berry into my mouth and my first reaction was that they're barely sour at all! I honestly got a little mad for a moment there. Sure, they're yummy, but with a name and reputation like Sour Patch's, I was expecting more "oomph" with the sour sanding sugar. I had a mini-bag of the classic Kids the other day at work and they were SOUR. My tongue was raw by the end of the bag, and when I shared them with my sister she asked if they had amped the sourness up a bit or something. It was a super sour bag of kids, comparing these strawberries to those? This is pathetic. For the record, these are really yummy strawberry gumdrops. The inner gumdrop portion is sweet, light, and floral. Plus, they're more authentically flavored that I was expecting. The big let down was the sour sugar on the outside of the candy. These are barely sour. Where's the Sour Patch-punch? This sanding sugar coating lacks the citric acid punch I was hoping for, but it's not a bad candy. 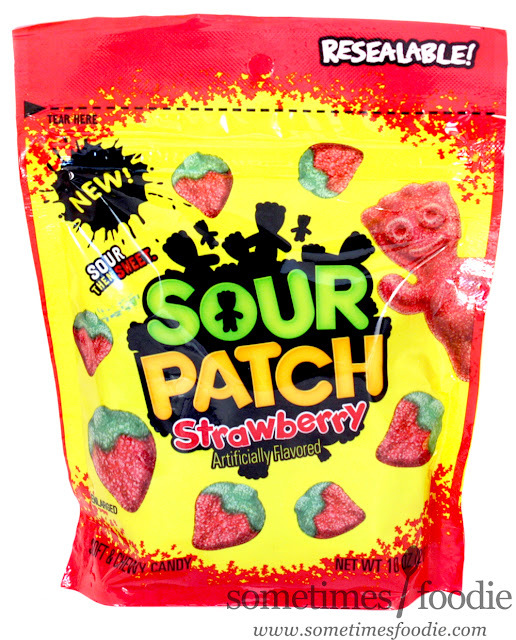 The lack of intense sour coating makes these more snackable, but if you're hoping for a true sour strawberry candy...this isn't it. They look like little anatomically correct hearts. Might be good for Halloween.